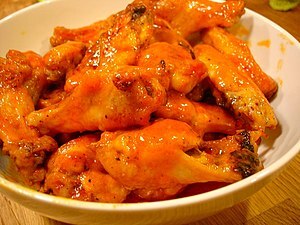 WINGS: Cut whole wings at joints and discard tips. Sprinkle wings liberally with Lawry’s Seasoned Salt. Deep fry until golden brown and crispy. Drain on paper towels. SAUCE: Combine melted butter and hot sauce in a large bowl, mix well. Add wings and coat evenly. Goes great with a fresh salad!